In Chesca’s school, they were learning about different parts of the house and what they’re used for. A few months back, the entire class would have a field trip every week to a student’s house. On the 1st week, they visited the dining room, 2nd week-bedroom, 3rd week-bathroom. The entire class would first gather in the living room to set some house rules. Of course the teachers wouldn’t want any accidents to happen in the house or anything to be broken. So they’re told to always use their “walking feet” because no running is allowed. Here's teacher giving the house rules to the class. Then they go to the part of the house that’s being discussed in class for the week. After the discussion, kids end up playing in the bedroom of the owner (student) of the house. After 10-15 minutes of playtime, they all gather to the dining room to eat their lunch. 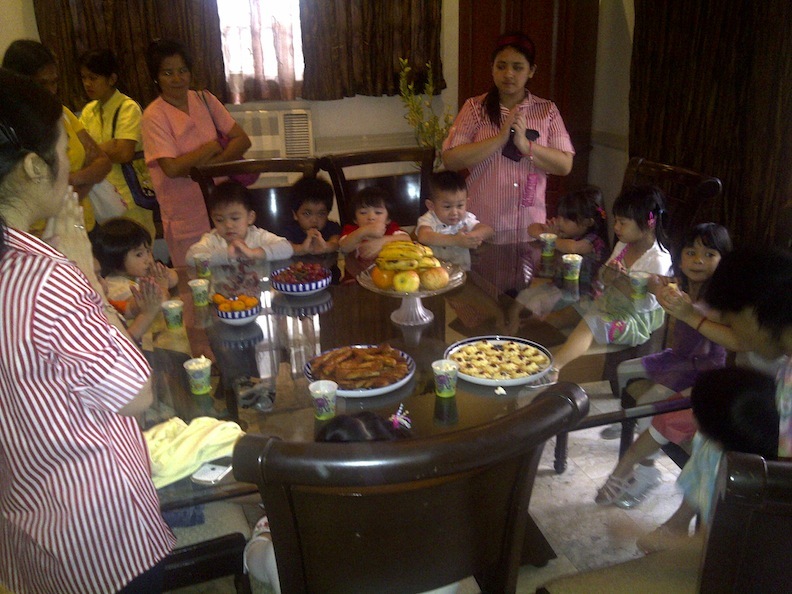 Kids enjoy eating together! I’m happy with the school as it tries to really show kids actual things that are being taught in school. During this particular month, Chesca kept going around the house and saying what kind of room she was in and what it’s for. I’ll be posting more toddler activites. Watch out for field trips about “transportation”. Riding the jeepney, trip to fun ranch, and even going to an actual helicopter.